The most famous and the largest city in the Pennsylvania State, Philadelphia has been one of the top tourist places in the United States for years. Having a population of more than 1.5 million, it stands as the sixth most populous city in the U.S. It is also called as the birthplace of life, happiness, and liberty. In its five beautiful counties, there are endless things to discover for you as a travel lover. Having various big and small vacation rentals to serve tourists, the city has many fascinating historic sites, natural sceneries, museums, parks, and restaurants to please you. In fact, you will always remember the moments spent here in Philadelphia with your friends or family in vacations. Throughout the year, foreign tourists visit the city and spend unforgettable moments in its vacation rentals. From historic sites to natural wonders, museums to parks, and shopping to nightlife, you won’t get bored for even a minute on your trip to this city as it offers endless entertainment to its tourists. There are 100-year-old cheese shops to give you a unique taste, buildings with unique art, and a passionate culture to welcome you. Philadelphia keeps its promise of an urban and offers you all the attractions that you may think of in an urban city. Most importantly, tourism is one of the leading industries in the city and it gives the lion's share to the economy of the region. You'll see leisure, convention, and business visitors throughout the year here in this city. 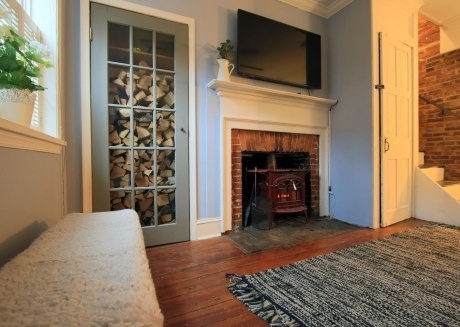 To facilitate the visitors, there are vacation rentals on almost every main and remote location of Philadelphia. When it comes to making online booking of vacation rentals prior to arrival, CuddlyNest is the right platform for you as we provide rental houses, apartments, villas, condos, cabins, and other properties in the United States, Mexico, France, Spain, Switzerland, Italy, and many other countries. Having a professional team we facilitate both hosts and guests. We serve guests by providing highly facilitated vacation rentals at the most competitive rates. Moreover, we serve hosts by providing them with a reliable platform to list their properties and get guests throughout the year. 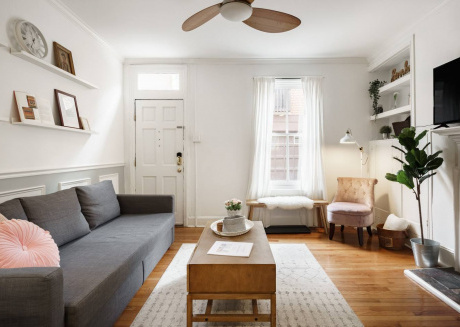 In Philadelphia, we can provide you vacation rentals that will not only facilitate you with high-quality service but will also suit your budget. Whether the Museum of Art, the Franklin Institute, of the Liberty Bell, we can provide you vacation rentals near to all the top attractions of the city. Philadelphia is indeed famous for its rich history and culture. The most famous and important place of the city is the Independence Hall where the independence and constitution were declared and signed. Other than that, the Philadelphia Museum of Art and the lovely Delaware River are also the icons of the city. Also called the most historic square mile of America, this particular park has so many sites associated with the American Revolution. The main point in the parks is a UNESCO World Heritage Site, the Independence Hall. It was in the 18th century when the declaration of the independence and the constitution of the United States were declared at this hall. Since that time, the hall holds importance as one of the most famous sites in the region. The Liberty Bell that is an iconic symbol of the independence of America is also displayed across the street of the hall. Apart from these two main sites, there are many other buildings in the park that include the First and Second Bank of the United States, the Bank War Carpenters' Hall, City Tavern, and a museum as well. CuddlyNest can provide you vacation rentals near this park. If you love to visit unique and interesting places, you must go to this Eastern State Penitentiary that was once a famous American prison from 1829 to 1971. This particular prison is still quite well-known because some of the most notorious criminals like Willie Sutton, Al Capone, James Bruno, were held here. It was a huge model for up to 300 unique and isolated prisons particularly designed for dangerous criminals. When the building was completed, it was the United States’ largest and most expensive building of that time. Today, the building falls in the National Historic Landmarks and remains open for seven days in a week as a museum for the public. Originally chartered back in 187t6, this museum is one of the top tourist attractions in Philadelphia because it has a collection of more than 240,000 sculptures, prints, painting, armor, photographs, drawings, and other objects. These sculptures are from Europe, America, Asia, and different other regions. There are several annexes in the art museum and each annex is famous for its own art. Rodin Museum, Ruth and Raymond G. Perelman Building (more than 150,000 painting, prints, drawings, photographs, furniture, and textile costumes), the house of Cedar Grove and Mount Pleasant, and different other annexes are located in Fairmount Park. The seat of the government, Philadelphia City Hall was designed by Thomas Ustick Walter and John McArthur Jr. They gave a beautiful Second Empire style to the building and made it one of the most beautiful buildings in Philadelphia. Located in the central district of the city, the zoo was actually the first true zoo all over the United States. There are various animals in the zoo that are quite difficult to feed in captivity. Alongside with ZooTampa at Lowry Park and San Diego Zoo, this zoo of Philadelphia stands as one of the most famous zoos in the United States. In case you are traveling in winters, Blue Cross RiverRink is a must-go place for you in this city. It’s has been a famous winter tradition in Philadelphia for more than 25 years. The place remains open from the end of September to the beginning of March. After spending a peaceful night in our vacation rentals, you can spend a great day with your friends of the family at this park while enjoying its world-class ice skating, fairytale winter landscape, fire pits, beautiful lightings, kids play areas and many other attractions. So, pack your bags now and enjoy your vacations with your beloved ones in Philadelphia!